This last week of films from the seventies has got to make you movie goers of today jealous. 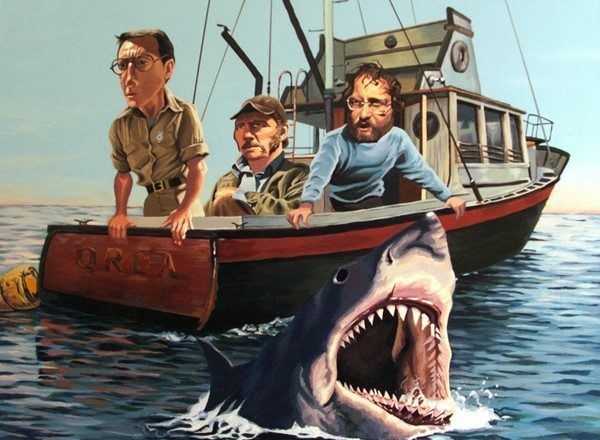 Jaws, Monty Python and the Holy Grail, and now Animal House. This was the college comedy of the seventies. It defined what a campus comedy would be for the next 30 years, it made a movie star out of John Belushi and established John Landis as the go to director for comedy themed material for the following decade. The poster of Belushi as Blutto with a beer, hung on dorm room walls, office doors and anywhere else people could fit it. The movie was set sixteen years earlier then when it came out, but college students have emulated the attitude ever since. Amanda believes that the Trojan Marching Band is trying to exist as a clone of Delta house. From all the drinking and stupid nicknames I saw when she was in the band, I don’t think she was far off the mark. This was the summer of 1978, the last summer before my final year as an undergraduate. The debate team had been doing research all summer long, the Western Forensic Institute was convening for the last time, and we were getting ready for what we expected to be a banner year. My debate partner Rick Rollino and I, felt like the chance to be the top USC team was in our grasp. Maybe this was a distorted view, because there were still several great debaters coming back for that year, but the legends that had dominated our time there had moved on. We had swagger in our attitude. It did not work out as well as we had hoped based on the previous year, but we still were quite successful and I am proud of what we accomplished. Rick and I had run for Co-Captains of the Debate squad and we were fortunately beaten by our good friend Leo Mohr. Leo was going to be debating with Bill Gross at that point but would soon move into a partnership with Kim Maerowitz. One summer night, as we were winding down a day at S.C. doing practice debates, the whole squad seemed to decide to go see this movie together. For some reason we ended up in Pasadena at the same theater I mentioned in my JAWS post a couple of days ago. Can you imagine anything more perfect than a group of good friends, seeing this movie on a summer night just a few days before the fall term started? We had a blast. The theater was full, I was a senior and we had freshmen and sophomores that looked up to us. And we were leading them into this debauchery. What Fun. 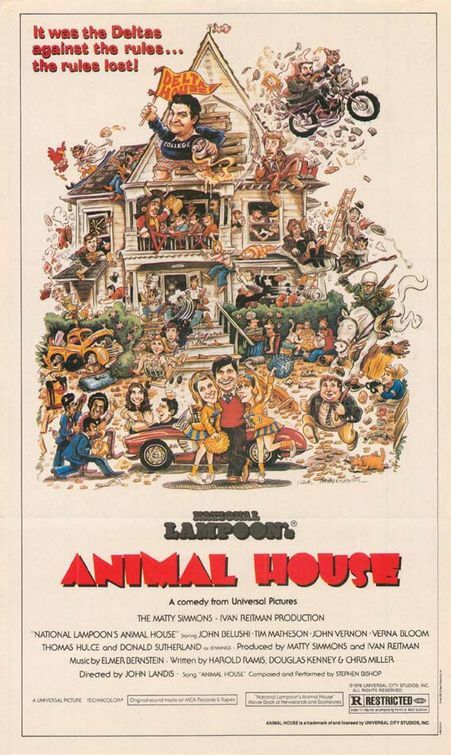 Animal House is critic proof because the audience for it is always going to see themselves in the story. There are plenty of jokes, but it is all in aid of a simple nostalgia story. Unlike some of the comedies that would come later, like Airplane, this was not a joke movie but a comedy. The humor grows out of the situation not from a sight gag or a throwaway pun. Even the wild out of control scenes stem from the characters or the story. Belushi’s trip through the cafeteria has plenty of sight gags but they come from the devil-may-care attitude and slovenly character that Belushi created. His Blutto was a hero to college students, not because he was a slob, but because he was one of us. He takes advantage of too much beer, naive freshmen, and a general lack of supervision. There are only two sight gags in the movie that take us out of the notion that we are watching real events. One is Kevin Bacon flattened by the crowd at the parade (this is a joke that foreshadows Airplane! and The Naked Gun), the other involves Belushi. When he is on the ladder, peeking in the Sorority house, he bounces the ladder down to another window. It is just as unrealistic as the other gag but it works because we can imagine Blutto trying to do this even if it is not physically possible. The scroll at the end of the movie, showing what became of the characters, was probably a parody of the more sober ending of American Graffiti. The jokes here were sly and topical. For several years after, Universal Studios also gave a discount to people who actually asked for Babs. This movie was re-released a couple of times in the next year or two, but that may have been the last set of re-releases for a movie except for special event type pictures. Video tape was coming, and people would enjoy reliving their movie experiences at home rather than at the theater. It was the end of an era because of technological innovation. The next summer would have some very different moods around it. I loved the summer of 1979 despite all the tough things that happened in our lives that year. The closing of summer 1978 marked the end of my childhood. The memory of going to this movie is a lot like a more heartwarming cross between the final character scrolls of Animal House and American Graffiti. 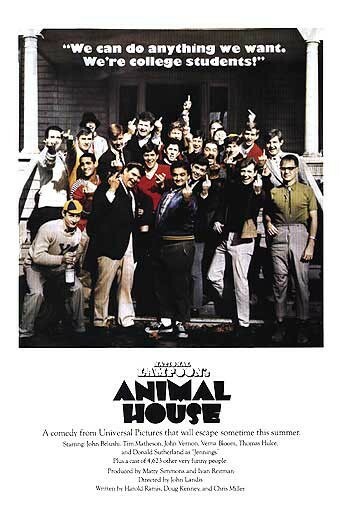 From an historical point of view the world was changing a great deal when Animal House was the king of comedy, but if you want to find the specific point that the 1970s came to a close, it won’t be when the calender slipped into the eighties, it was not the election of Ronald Reagan or the death of disco. The 1970s died on a day in March 1981, at a hotel in Hollywood, where the shooting star that was Blutto in Animal House, went to that great Toga Party in the sky. Definitely a nostalgia story, but the beauty is that College students are always going to find the similiarities with themselves and relate to it. Thanks Dan, I thought you might appreciate a view from someone who lived through that experience at the right age. Every time I see SNL, I mourn that Belushi is not with us.